This colorful salad is so refreshing and crisp. For the radishes, use any kind of radishes that you like, they come in many bright colors. Radishes. as well as cucumbers, hydrate the skin and nourish the tissues in your body. They cleanse the digestive system and fight symptoms of constipation. The corn speeds up weight loss. It supports a gluten-free diet and is rich in vitamin B6. Slice a bush of radish and 1/2 a cucumber. Drain 1 can organic corn, add to the sliced vegetables. 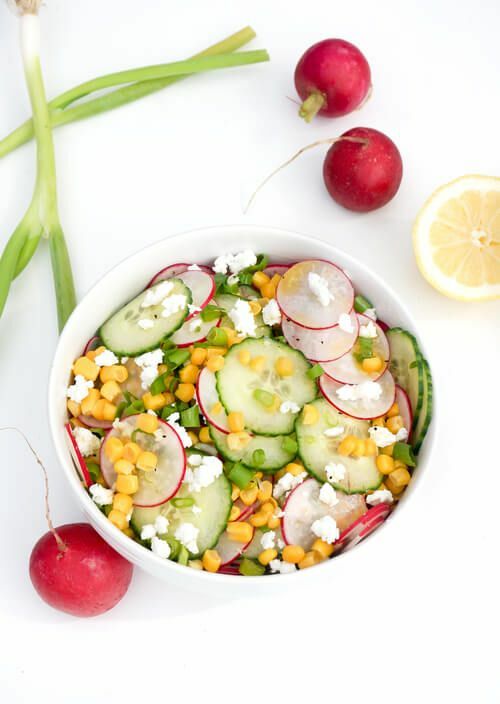 Chop green onion, add to the vegetables along with 1 Tablespoon feta cheese. Drain one can organic corn, add to the sliced vegetables.